The Dividist Papers: "Divided We Stand... " on "Divided We Stand." "Divided We Stand... " on "Divided We Stand." 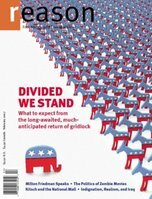 The current issue of Reason features the cover story "Divided We Stand - What to expect from the long-awaited, much-anticipated return of gridlock." "But as bad as November’s rout might have been for the GOP, libertarians and other small-government types are the ones who have taken the real thumpin’ during the last six years. Unfettered Republican control of the federal government has given us a seemingly endless series of hyperactive, unconstrained, and largely ineffective government activities: the No Child Left Behind Act, the Medicare drug benefit, record levels of spending, and a foreign policy that, to be charitable, lurches between deadly incompetence and deadly hubris." The article surveys the views of a number of DWSUWF favorites, including Ryan Sager, William Niskanen, and Jonathon Rauch, and merits inclusion in the permanent sidebar "Relevant Links" of this blog. We also welcome the opportunity to rip Reason On-line graphics as payback for their unattributed use of DWSUWF graphics last November. DWSUWF found the article to be an excellent retrospective of the divided government meme. Despite the subtitle ("what to expect..."), it is a rehash of views that have been expressed at Reason, at Cato, at Washington Monthly, in this blog and elsewhere over the last year. While a good overview, it disappoints because there is little new in the article. Conspicuously absent is any consideration of the ramifications of the divided government meme for the '08 presidential election campaign. Note to Reason editors: Time to start looking forward. Assuming that the expected benefits of divided government hold true to form (as outlined by Niskanen et. al.) over the next two years, then a divided government result will remain just as desireable in '08 as it did in '06. There are some important elements to consider for that election. Specifically, it seems unlikely that the Democrats will be able to screw up as badly in two years as it took the Republicans six to achieve, so it is doubtful that the Democrats will lose their significant majority in the House of Representatives. Although their Senate majority is razor thin, structural factors give the Democrats a big advantage in '08. Of the 33 Senate seats contested in 2008, 21 are held by Republicans and 12 by Democrats. Simple numbers - simple analysis - the Republicans have a lot more at risk, and will be playing defense. The Democrats have many more opportunities to take seats than Republicans. Advantage Democrats. Simple Conclusion: The only way to maintain a divided government in '09, is to elect a Republican President in '08. If we then layer on the fact that GWB is hell bent on making sure the Iraq war is even more unpopular and a bigger issue in '08 than it is now, one wonders whether any Republican can be elected President in '08. The spectre of Single Party Democratic control of the federal government hangs over the '08 contest. There is hope. There is exactly one Republican presidential hopeful who has been on the right side of the war since '03. That, in the considered opinion of DWSUWF, makes him the only electable Republican in '08. And that makes Chuck Hagel the DWSUWF Designated Divided Government Presidential Candidate of choice. "Hagel has a long, sad face, one side of which was seared by the flash of an exploding enemy mine almost four decades ago. But he is almost gleeful when he talks about the coming debate on Iraq. He thinks Congress will awaken from its passivity and begin questioning how Bush is spending blood and treasure on Iraq. "The administration is going to be forced to come up and explain, 'Where is the money going?' " says Hagel. He rejects the notion that the newly Democratic-controlled Congress will shy away from cutting off at least some of the funding for the war. (The somewhat cynical view on Capitol Hill is that the Democrats will let Bush have the money—and also the responsibility for a failed policy.) He foresees Congress's agreeing to pay for existing force levels—but not to send more troops. The White House, he says, can no longer bully Republican members into submission. "The Republican Party has to go through an election next year, the president doesn't," says Hagel." "But governors, who normally make the strongest presidential candidates, seem a little irrelevant this time around. They aren't likely to sound as credible as senators on the nuances of Pakistani politics or the readiness of the Third Infantry Division. There's more conventional wisdom that's in danger of cracking, too. Pooh-bahs in both parties have convinced the candidates that they have to raise $100 million this year to be competitive. This is nonsense in the Internet age, peddled by consultants who need that booty for their own pockets. In congressional elections, money is a cause—it leads directly to success. In presidential politics, money is an effect—it follows quickly the momentum that's generated in the rough and tumble of the "free media" campaign. Chuck Hagel might not run. But if he does, [Hagel] would be formidable. It's the issues, stupid." Found an article you might find interesting regarding Senator Hagel, 2008, and divided government. The problem with Eric's argument is two-fold. First, the case made for divided government by Slavinski, Niskanen, Scarborough and other conservatives, is based on historical fact using a specific definition of Divided Government. To whit: Divided Government occurs when the PARTY of the President in the Oval Office, does not have majority PARTY control in both houses of congress. Eric finds this definition inconvenient, so he just makes up a new one. Sorry Eric. It just doesn't work that way. Second he posits a hypothesis to solve the problem he acknowledges exists with this government, suggesting we only elect ideologically pure Republicans to Congress. Ok, maybe it works, maybe it doesn't. It does not seem probable to me, but in any case - it is impossible to implement this in the 2006 mid-terms. While, on the other hand, it is very possible to get a divided government in the 2006 mid-terms, and the documented benefits of restrained growth in spending, better oversight, and better governance for the next two years. Seems like a pretty easy choice to me."